As we have taken a look at why we have been given the whole armor of God, and why we are commanded to wear it and use it, we will now begin to look at this armor piece by piece. What is the armor we have been given? How does the armor function, or better asked, how do we use it effectively? The first piece of armor is really not viewed as armor, that is, it does not offer protection. It is a belt. So why is the first piece of armor mentioned a belt? Simply put, because without a belt everything else falls apart! Paul would have been referencing the familiar armor of a Roman soldier to illustrate a spiritual truth and we learn that the physical and spiritual reality are amazingly similar. For the soldier, who wore a loose fitting outer tunic, when it came time to fight, those loose ends and the flowing material of this garment would be a hindrance or even give the enemy something to exploit and grab a hold of in battle. 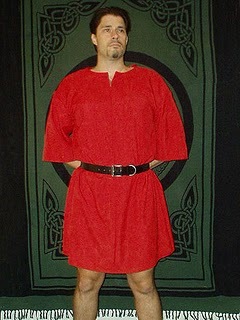 So the tunic was pulled up and tucked into the belt. This leather belt around the waist gave him a place to tie it all up. 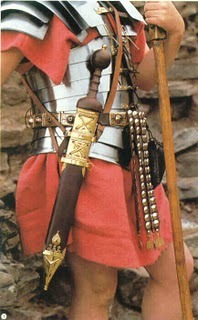 In fact, as we examine the armor we will learn that most every other piece was linked to the belt in some way. Looking outside of a military application, we see this used to reference those who wore robes. When they had hard work to do or had to run, they would “gird up their loins”, meaning that they pulled the ends of the robe up and either tied them around the waist or tucked them into a belt in order to be able to work or run without being tangled and tripped up. Spiritually speaking we are told in 1 Peter 1:13 to “gird up the loins of your mind”, that is, to pull in all the loose ends of our thinking, to reign in a wandering mind so that we might be ready and able to think clearly and discern wisely as we make decisions. It is a willful removal of those things that would otherwise confuse and confound us so that we might think what we ought to think (Philippians 4:8). So what is this belt? What is it that we are to use to gird up our loins/mind so that we might be able and ready to think, work, or fight without hindrance or confusion? It is called the belt of truth. More than just true content or facts, this refers to truthfulness. We gird up our minds with truthfulness. It is an attitude of being true and an action of seeking out and holding to truth. It is at the same time a rejection of lies and dishonesty. So what is this truth? It is the pure, infallible, inerrant, and inspired Word of God. It is truth. It is not only things that are true, as in true facts and figures. It is pure truth. Remember, we are to use this armor to stand against the schemes of the devil. How can we even recognize those schemes unless we know the truth of God’s Word? If we do not know the truth we will not know the counterfeit or the lie. In seeing that it is God’s Word that is the foundation of our armor in this belt of truth, it is that which holds all of the rest of our armor together. We see that the Bible is the very Word of God and as 2 Timothy 3 tells us, it is “profitable for doctrine, for reproof, for correction, for instruction in righteousness, that the man of God may be complete, thoroughly equipped for every good work.” The Bible is not a mere book. It is alive and active (Heb.4:12), eternal (Isa.40:8; Mat.24:35), perfect (Psalm 19:7), pure (Prov 30:5), and it is truth (John 17:17). Is it any wonder then that in order to achieve a victory over us the devil would first attack the Word of God? Think about the temptation in the garden. His first question was “Did God really say?” As he tempted Eve he started by calling the Word of God into question. He persuaded Adam and Eve to doubt God’s Word (Gen 3:1), to deny God’s Word (Gen 3:4-5), and then to disobey God’s Word (Gen 3:6). Throughout history we see attempts by heretics and false teachers to deny the truthfulness of the Word of God. Whether it is liberalism in its many manifestations, legalism, antinomianism, or any of the other many isms and heresies that keep popping up we see at the root of each an attack on the Word of God. Satan knows that if we take the belt off we have nothing to provide stability as we fight. In fact, once the belt is off we are no longer fighting but are already defeated. As we face liberalism in its many forms we find at the very foundational levels of thinking and faith a rejection of the absolute truthfulness of the Word of God. The Word is removed or reduced and counterfeits and mystical substitutes are provided that may make us think and feel good but in reality once the truth is gone we have no way to know right from wrong and no basis to believe anything at all. Liberalism denies inspiration, inerrancy, and infallibility. Liberalism denies miracles in favor of “scientific reason” which in this contect is actually neither scientific nor reasonable. Liberalism denies the truth of the gospel and the exclusivity of salvation in Christ. As many denominations have fallen to liberalism some have fought it off, but the danger for them is to take the Word for granted. Many who claim to uphold the truth of the Bible refuse to do what the Bible says – as if it is enough to have the Bible but a step too far to actually obey the Bible. These kinds of people will fight tooth and nail over tradition but all the while reserve the right to interpret the Bible for themselves, believing that whatever they think the Bible says is truth for them. This relativism reduces the Bible to a superstitious or ritualistic object to be waved about while the church has no clue as to what it actually says or means. This too denies the absolute truthfulness of the Word of God. How important is the Bible when it comes to putting on the whole armor of God? It is absolutely necessary. The breastplate and helmet are tied to it. It holds the sword. It keeps the tunic out of the way. It makes it possible for us to fight in close quarters, effectively and without getting tangled up. In other words, if we do not have the truth of God’s Word then we have no armor at all. There have been a few experiences that demonstrate how we really do view the Word of God and its relevance to life and faith. I want to look at these examples in order to give a warning. We must still fight for truth. We must hear and do the Word of God. We must gird our loins by putting on the belt of truth. Why? Because these three examples are taken from mainstream evangelical churches that claim to believe the Bible. The first example comes from a worship service my wife and I attended at a local church. It was absolutely idolatrous. The “special music” did not even mention God or Christ, it was not even a religious song or a song of worship, but an emotional song about daughters in trouble and how they could count on their mothers to stand with them through the hard times. Totally man centered (or woman centered I should say), and completely inappropriate for the worship of God. Then the pastor started his message by talking about the cultic roots of pagan practice and showing how many in our culture are involved in the same activities today. But he never once actually used the Word of God to make his point about right and wrong. His basis for determining what was right and wrong came from a movie he had seen, not from the pages of Scripture. And so the congregation was encouraged to take the lesson of this blockbuster movie and take it to heart in order to know the truth about how to act and think in certain situations. The other problem with this approach was that the scene in the movie that he used to make his point was absolutely contrary to the Scriptures. How pathetic and infuriating. We left before the service ended. The second example we experienced when a pastor from a church in our area broadcast his services on the radio and we heard one day that he was preaching a new series of messages that were aimed at helping Christians understand their new nature in Christ. His text? Well, there was no Biblical text. He actually said that his congregation and those listening on the radio would not need their Bibles for the next several services, so they could be left at home! Then he proceeded to “preach” four passages taken from Mary Shelley’s Frankenstein!! I am not making this up. In order to be “relevant” and in order to reach people with “the truth”, he set the Bible aside and preached a work of literature that is fiction. The third left me shaking my head in disbelief as two Christians decided to debate two atheists and proclaimed that they could prove the existence of God without the Bible or any appeal to faith. They could do it 100% scientifically they said. Now, these two brothers in the Lord were surely well meaning, but where they failed from the very start was where they removed the very foundation of the gospel by claiming that they could talk meaningfully about the gospel without the Bible. The Word of God is His revelation of Himself to us. Faith comes by hearing and hearing by the Word of God (Rom 10:17). It is the Word of God that the Spirit uses to convict us of our sin, to call us to new life in Christ and convert us. Look at Psalm 19:7-11. The Bible is truth. It is effective. And without it there is NO GOSPEL! What is the point of trying to prove the existence of God if our goal in doing so is not to call sinners to repentance and faith in Christ? Godliness consists in the right knowledge of divine truths, or the fundamental principles of the gospel. Secondly, Godliness is a holy conformity to these sacred and divine principles. Keach warns us not to be deceived by false godliness but to be sure to receive the power of godliness, for godliness without power is no godliness at all. As a result we must not add to or take away from the Word of God, nor must we ever believe that God needs us to make it any more true or beautiful than it is. The truth of God’s Word is foundational to standing against the wiles of the devil. The belt of truth must be worn, used, and relied upon if we are to fight and overcome. If we take off the belt, we will not fight and we will not win. If we take off the belt we have nothing to believe and nothing for which to live or die. If we take off the belt, we will fall into sin. This week, let us look around us and examine ways that we and others try to lay the belt of truth aside as an inconvenient or useless garment. And when we see these things let us commit even more stridently to put on the belt and keep it on, believing God and taking Him at His Word. The way we handle the truth, the way it is preached, heard, and obeyed tells us everything we need to know about our churches and our lives.